John Montgomery Ward (March 3, 1860 – March 4, 1925), known as Monte Ward, was an American Major League Baseball pitcher, shortstop and manager. Ward was born in Bellefonte, Pennsylvania, and grew up in Renovo, Pennsylvania. He led the formation of the first professional sports players union and a new baseball league, the Players' League. Ward attended the Bellefonte Academy in the early 1870s and, at 13 years of age, he was sent to Pennsylvania State University. In his short time there, he helped jumpstart a baseball program and is often credited for developing the first curveball. However, he was kicked out of school for pushing an upperclassman who attempted to haze him down a flight of stairs and stealing chickens. The following year, in 1874, his parents James and Ruth died. He tried to make it as a travelling salesman, but when that proved unsuccessful, he returned to his hometown. It was there that he re-discovered baseball. In 1878, the semi-pro team that he was playing for folded, which opened the door for him to move on to a new opportunity. He was offered a contract to pitch for the Providence Grays of the still new National League, an all professional major league that had begun its operations in 1876. Ward's first season with the Grays was a successful one, going 22–13 with a 1.51 ERA. He played that season exclusively as a pitcher, but during the following two seasons he played increasingly in the outfield and at third base. Ward had his two finest seasons as a pitcher, going 47–19 with 239 strikeouts and a 2.15 ERA in 1879 and 39–24 with 230 strikeouts and a 1.74 ERA in 1880. He pitched nearly 600 innings each year (587.0 in 1879 and 595.0 in 1880). As a 19 year old pitcher, he won 47 games and led the 1879 Providence Grays to a first place finish. In 1880, he began to play other positions. On June 17, 1880, Ward pitched the second perfect game in baseball history, defeating future Hall of Famer Pud Galvin and the Buffalo Bisons, 5–0. Lee Richmond had thrown baseball's first perfect game just five days before, on June 12. The next perfect game by a National League pitcher would not happen for 84 years, when Jim Bunning pitched a perfect game in 1964. Ward also expanded his leadership role to include managing when he became a player-manager for the team's final 32 games, winning 18 of them, as the Grays finished in second place. The seasons of 1881 and 1882 were the first in which he played more games in the outfield than he pitched. This was due to a nagging arm injury he originally incurred sliding into a base. He still pitched well when he did pitch, winning 37 games over those two seasons and having ERAs of 2.13 and 2.59 respectively, and on August 17, 1882, he pitched the longest complete game shutout in history, blanking the Detroit Wolverines 1–0 in 18 innings. By this time, however, the Grays felt his best days were behind him and sold their former ace hurler to the New York Giants. Ward moved to the New York Gothams (renamed the Giants in 1885) in 1883. An injury to his right arm while running the bases during the 1884 season ended Ward's pitching career. As he could not wait for his arm to heal before he returned to the field, he taught himself to throw left-handed in order to play center field for the remainder of the 1884 season. He replaced Jim Price as the Giants' manager for the final 16 games of the 1884 season. 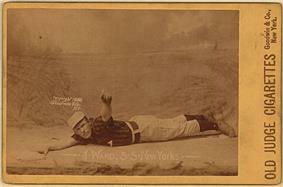 With his arm fully recuperated, he became the everyday shortstop in 1885. Ward graduated from Columbia Law School in 1885 and led the players in forming the Brotherhood of Professional Base Ball Players, the first sports labor union. Ward and the players had become frustrated with the owners reserve clause, which allowed them to sign players to one year contracts and then not allow them to negotiate with other teams when those contracts expired. The players felt that the owners had absolute power. At first, the players had some success, gaining the freedom to negotiate with other teams when they were asked to take a pay cut by their current team. In October 1887, Ward married actress Helen Dauvray. In 1888, after the Giants had finished first in the National League, and had won a playoff series known today as a "World Series". They played the St. Louis Browns of the American Association for the "Dauvray Cup", which was named after Ward's wife. The team never actually received the trophy as it was stolen and its whereabouts are still unknown. Ward and a group of All Stars then headed off on a barnstorming world tour. The owners held their winter meetings, and created a classification system that would determine a player's salary. Under the system the most a player could earn was $2,500. The Giants then sold Ward to the Washington Nationals for a record price of $12,000. Ward was furious and left the tour early. He then demanded a meeting with the owners, and said he would refuse to play for Washington unless he received a large portion of his record sale price. Washington would eventually refuse payment on the transaction, nullifying the deal. The owners denied Ward's request for a meeting to discuss the new classification system, saying there would be no talks until after the upcoming season. Though Ward and the union fought hard for these issues, this did not distract him or his Giants team as he hit .299 and helped the Giants capture their second straight "World Series" title in 1889. Ward realized that negotiations with the owners were going nowhere and threatened to create a Players' League. The owners thought of it as nothing more than an idle threat but had failed to realize Ward's connections in the business community, and he began to launch the new league. This new Players' League included a profit sharing system for the players and had no reserve clause or classification plan. The season began in 1890 with over half of the National League's players from the previous year in its ranks. 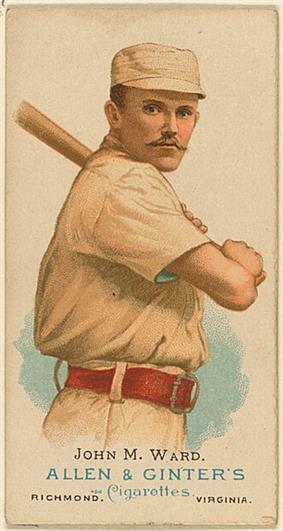 Ward acted as a player-manager for the Brooklyn club, nicknamed the Ward's Wonders, and finished seventh in the league with a .335 batting average. While the Players' League drew well at the box office, the teams' owners grew nervous when the money did not come in as expected because of the profit sharing system. Soon they began holding secret meetings with their National League counterparts and, one by one, sold their teams to the rival league. Due to an agreement after the dissolution of the Players' League, Ward stayed in Brooklyn as player-manager for the National League team, the Brooklyn Grooms. 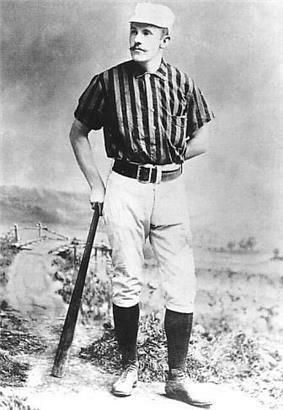 Following the 1892 season, Ward expressed his desire to return to the Giants and was sold to his former club for $6,000. Following the 1894 season, he retired at the age of 34. He finished his career with a .275 average, 2,104 hits, and 540 stolen bases. He is the only man in history to win over 100 games as a pitcher and collect over 2,000 hits. Ward also holds the third-best career WHIP in major league baseball history behind only Addie Joss and Ed Walsh. Ward retired from baseball at age 34 in order to enter the legal profession. As a successful lawyer he represented baseball players against the National League. Later he acted as president and part-owner of the Boston Braves franchise and became an official in the short-lived Federal League in 1914, acting as the business manager of the Brooklyn Tip-Tops. In the last quarter century of his life, Ward's sporting passion became golf. He won several championships around New York, played all over Europe, and competed regularly in the United States Golf Association U.S. Amateur, he finished second in the prestigious North and South Amateur Championship at Pinehurst Country Club in North Carolina in 1903. The North and South Amateur was the equal of any major golf event at the turn of the century. The first North and South event took place in 1901. Ever the organizer, he was one of the founders of the New York Golf Association and the Long Island Golf Association. Ward died in pneumonia, and is interred in Greenfield Cemetery in Uniondale, Long Island, New York. He was elected to the Baseball Hall of Fame by the Veterans Committee in 1964. Stein, Fred (2002). And the Skipper Bats Cleanup: A History of the Baseball player–manager, with 42 Biographies of Men Who Filled the Dual Role. Jefferson, NC: McFarland. ^ a b "John Montgomery Ward's managerial statistics". baseball-reference.com. Retrieved 2007-11-17. ^ a b c d e "John Montgomery Ward's career statistics". baseball-reference.com. Retrieved 2007-11-17. ^ a b c d e f g h i j k l m n "Simply Baseball Notebook: Legends". z.lee28.tripod.com. Retrieved 2007-11-17. ^ http://www.ancestry.com 1860, 1870 US Federal Census Bellefonte, Centre, Pennsylvania 1860 Child Montgomery born Mar 1960. ^ "1879 Providence Grays team page". baseball-reference.com. Retrieved 2007-11-17. ^ "Perfect games by pitchers:Box scores". baseball-almanac.com. Retrieved 2007-11-17. ^ a b "Who Was Baseball's Most Interesting Character? Monte Ward, by Mike Attiyeh". baseballlibrary.com. Retrieved 2007-11-17. ^ "1888 New York Giants team page". baseball-reference.com. Retrieved 2007-11-17. ^ "1889 New York Giants team page". baseball-reference.com. Retrieved 2007-11-17. ^ "John Montgomery Ward's Obituary". New York Time, Thursday, March 5, 1925. Archived from the original on 2007-09-29. Retrieved 2007-11-17. ^ "John Montgomery Ward's Hall of Fame profile". baseballhalloffame.org. Archived from the original on 2007-06-08. Retrieved 2007-11-17. ^ "John Montgomery Ward's career statistics". retrosheet.org. Retrieved 2007-11-17.